A partnership between Boeing and Queensland businesses has seen the design and development of a groundbreaking prototype airspace situational awareness system with remotely piloted aircraft systems (RPAS) enabling technology. The new system, which is currently undergoing testing, is capable of remotely detecting and tracking other airspace users and providing the resultant air picture over Telstra’s cellular network back to a ground-control station. This enables pilots to safely operate RPAS over extended ranges and in full compliance with CASA regulations. The new protoype was developed with support from the the Queensland government’s Advance Queensland Platform Technology Program, Boeing's subsidiary Insitu Pacific, Queensland SMEs, Telstra and the Shell Queensland Gas Company (QGC). Boeing Australia, New Zealand, and South Pacific president Maureen Dougherty said the world-first prototype is just another example of Boeing's strong history of collaboration and partnership innovation in Australia. "As a world-leader in aerospace, Boeing takes very seriously our responsibility to engage small-to-medium sized companies in the development of new capabilities, connecting them with our global supply chain and providing local industry with greater international export opportunities," said Dougherty. "Queensland and Boeing working together on the next generation of cutting-edge technology is another milestone in our strong 90-year relationship with Australia. "We greatly appreciate the support of our project partners, the innovative Queensland businesses and the Queensland government that has made the development of this technology a reality." 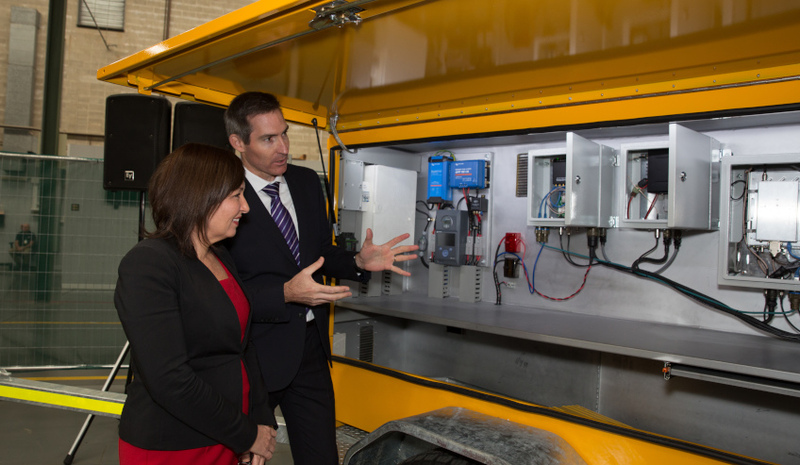 Queensland Minister for Innovation, Science and the Digital Economy Leeanne Enoch said so far eight Queensland SMEs have been engaged to provide systems engineering support and develop and manufacture hardware for the project. "The project will lead to the development of world-first technology to enable the use of RPAS to inspect and capture critical data on natural resource infrastructure and with wide application across a range of resource industries," Minister Enoch said. "This progress cements Queensland’s reputation as Australia’s leading player in developing civilian UAS technologies and of growing new innovative technology in Queensland. "Unmanned aircraft are safer and much more efficient in carrying out sweeps of natural resource infrastructure, including well-heads, than manned aircraft and ground inspection crews." Director of Boeing Phantom Works International, an advanced prototyping arm of Boeing, Shane Arnott also praised the efficiency the new system will provide RPAS. "Boeing is focused on integrating technology-driven capabilities that exponentially increase our ability to make existing systems smarter, and operations safer and more efficient," Arnott said. "The growth of RPAS technology globally presents a great opportunity for Queensland and the state is naturally well positioned with large open areas to further support development of these technologies." While the advancement of this technology has been a strong focus for the companies involved, director of RF Technologies Michael Symes said the project has also allowed the SMEs to expand their capabilities. "The potential to extend our reach into global markets and the association with Boeing came at a good time for RF Technologies, following our business relocation to a wholly-owned, larger facility coupled with an investment in additional skills and technologies," said Symes. Boeing Defence Australia recently expanded its presence in Australia, with the Brisbane-based company opening a new office in Adelaide April this year. Boeing’s operations in Australia are its largest outside of the US. It has been focused on expanding into research and innovation through advanced prototyping arms like Phantom Works International.